The Shopping Center Group, a commercial real estate company with offices in 12 states, offers a wide variety of advisory services to retail tenants, landlords, and developers, including property management, construction supervision, and tenant representation. But The Shopping Center Group does more than ink sales and lease deals. The company provides clients with in-depth analyses of trade areas to, as it says on its website, "better understand the consumer, trends, market drivers, and the competitive retail landscape." GIS technology from Esri is used to analyze and visualize that data. Using two GPS datasets, The Shopping Center Group developed this map in ArcGIS Desktop to highlight the differences between where people who frequent Colonie Center in Albany, New York, live and where they work. This information is then used within Esri Business Analyst Online to uncover the slight variations in both the demographics and the psychographics of Colonie Center guests. "What we are is an information company, first and foremost," says Gregg Katz, director of innovation and technology at The Shopping Center Group. "It's the information that makes everything else go. We consider GIS and research to be the heartbeat of the organization. They allow [all our service lines] to tell a story." 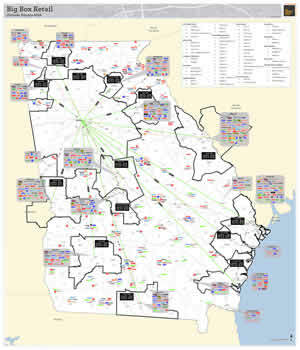 The Shopping Center Group operates 22 offices nationwide, including those based in Memphis, Tennessee; Louisville, Kentucky; Atlanta, Georgia; Charleston, South Carolina; Charlotte, North Carolina; Huntsville, Alabama; Miami, Florida; Newport News, Virginia; and New York, New York. Out of 215 team members, 28 are mappers. "We have one mapper to every four brokers," Katz says. "For a company our size and larger, that is unheard of. We are a production and mapping machine in terms of what we do for our retailers and clients." The company is beginning to use Esri Story Maps to provide a better understanding of markets or trade areas. And it's adding new types of datasets into the Esri ArcGIS platform, including cellular and GPS data, which the company receives from partner vendors that aggregate and analyze the data. "For the first time," Katz says, "instead of [only] understanding where consumers live, we're able to see how they move and what that movement does for a trade area and what that movement does for a location decision." ArcWatch editor Carla Wheeler spoke to Katz to learn more about how the company uses GIS. Wheeler: Tell me about The Shopping Center Group. Katz: We are a retail-only real estate platform. We specialize only in retail—we do no [work in] office, industrial, or anything else. We have four primary service lines. We work with tenants to find locations and optimize markets. We lease space for landlords. We manage retail properties. And we sell investment grade retail properties like large grocery-anchored centers or shopping centers. Wheeler: Where are you located in the United States? Katz: We are in 22 offices, and we cover mostly the East Coast. We go from New York down to Florida over to Mississippi and up to Kentucky. And about a year ago, we opened in Santa Barbara, California, with the intent of growing [on] the West Coast. Wheeler: Do you focus on large shopping areas or small strip malls? Katz: We tend not to do a lot of business with retailers in malls because malls have their own infrastructure. We focus on mixed-use centers, lifestyle centers, strip centers, and grocery-anchored centers. Having quick access to information is important to The Shopping Center Group when working with its retail clients. 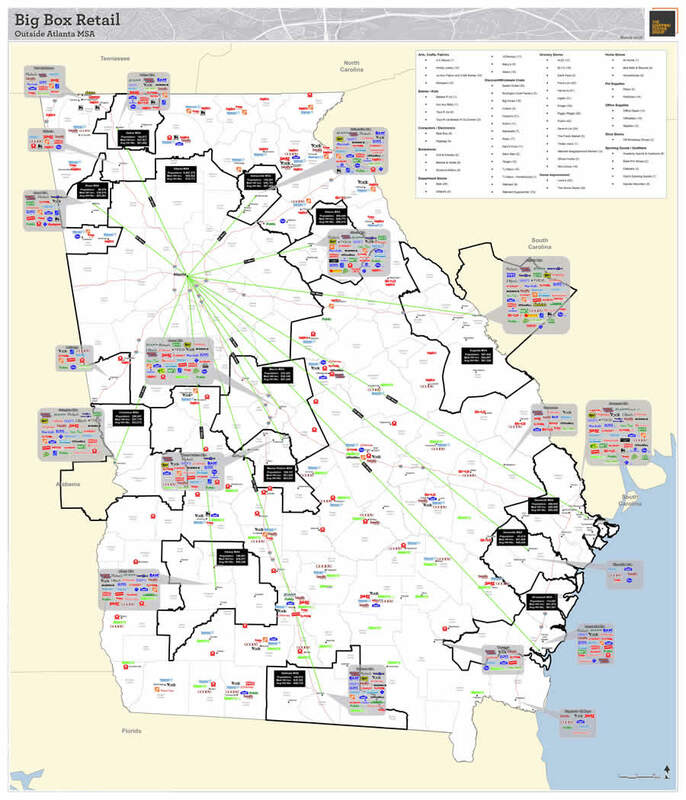 Created with ArcGIS Desktop, the Big Box Retail map provides The Shopping Center Group's brokers with a snapshot of metropolitan statistical areas (MSAs) and includes key demographics, major retailers, and the distances from Atlanta, Georgia. Wheeler: How does The Shopping Center Group use Web GIS? Katz: We have created apps that provide market intel for our team to use and eventually share with our clients. It gives us the perspective of what's happening in a specific trade area or information on retailers. Apps give us a clue as to where density is for residential, office, and industrial [areas] and the location of tourism hot spots. Custom reports can be called up on iPads and iPhones, and we are in the process of allowing our people to edit our proprietary database on the fly. So if we are out in the field and we see [that] something is missing in the database or something is closed or there is a vacancy we didn't know about, we can instantly update the database. Wheeler: What other types of data does GIS help you understand? Katz: We have been looking at analyzing and visualizing psychographic data, probably even more so now that we are in the Esri platform. It used to be straight demographics. But demographics don't tell the whole story. If we both make $50,000 a year, how you spend it and how I spend it are going to be very different. The other pieces we are starting to focus on a lot more are GPS data to show the movement of people and understand where they are living and where they go to work and how they move throughout the day. That allows us to better understand something we have been unable to in the past: their travel patterns in order to make decisions, including how to find the most optimal store locations. Each retailer and landlord is going to ask for something slightly different. So it was really important for us, when we ended up picking a platform four years ago, that we needed one that had [the] necessary data, such as demographic, psychographic, spending statistics, and a wide variety of other information, as well as the ability to integrate datasets from third parties. We needed to meet all the different needs of these retailers. It's understanding [the customer]—who they are, what they like, where they go, why they buy. It goes to why they buy and how they move throughout the trade area. Wheeler: What kind of Esri technology do you use? Katz: Because we believe in local market knowledge and in having boots on the ground, instead of a centralized GIS, we like to have GIS spread across the offices. People in each office use ArcGIS Desktop, Esri Business Analyst, and ArcGIS Online. ArcGIS Online is being used to share information internally and with clients. We have market overview aerials; that is, every retail trade area in our markets all across each state that we cover, we've got mapped in our database. If we want to look at apparel retailers, we turn on [the] apparel [layer]. If we want to look at restaurants, we can turn on restaurants. We can show each client different things. The web platform is giving us flexibility. So if we get on the phone with Whole Foods and they want to look at the grocers in the area or the drivers of population, we can give them an initial cursory view. Wheeler: GIS has been revolutionary for you. Katz: GIS is the heartbeat of what we do. What we do from a real estate standpoint is very visual. Back in the old days, so to speak, we were putting dots on maps—the old AAA maps—you would go get them and put dots on the maps and hope you were as accurate as you could be. Now we have [digital maps] with information about population density, the employment base, and the entertainment venues. We can pop those up and get a full perspective. Wheeler: Can you give me an example of how a GIS analysis changed one of your customer's business decisions? Katz: We have had several cases where we have had retailers turn down a location. When that happens, we ask why. Sometimes they say it was related to demographic criteria or a concern about cannibalization to an existing store. There have been numerous occasions where we've been able to go back and analytically show that those concerns were unfounded and then gotten deals approved that were previously rejected. So GIS absolutely can benefit us. For more information, watch Katz's presentation at the 2016 Esri Business Summit. View the Esri Case Study: The Shopping Center Group (TSCG).